March prime weekends still available!! Also HUGE savings for Dec 2019 HOLIDAY now - Book Early and Save Big! Xmas week ! Email owner to find out about the current SPECIAL - HOUSE is in PRIME location! Email owner! (Refundable security extra; but refunded 2-3 weeks after stay). Cozy 4BR/ 2BA - Main house unit is 1800 square foot open layout with private hot tub for this unit only and beautiful slate fire place: 4BR/ 2 BA. New living room log queen futon in living room - adds to the cozy and warmth of house! We also have a pullout queen couch. Queen bedroom upstairs has an additional twin bed - perfect for families with little kids. We sleep 13 comfortably!!! (Including queen futon in living room and queen pullout). 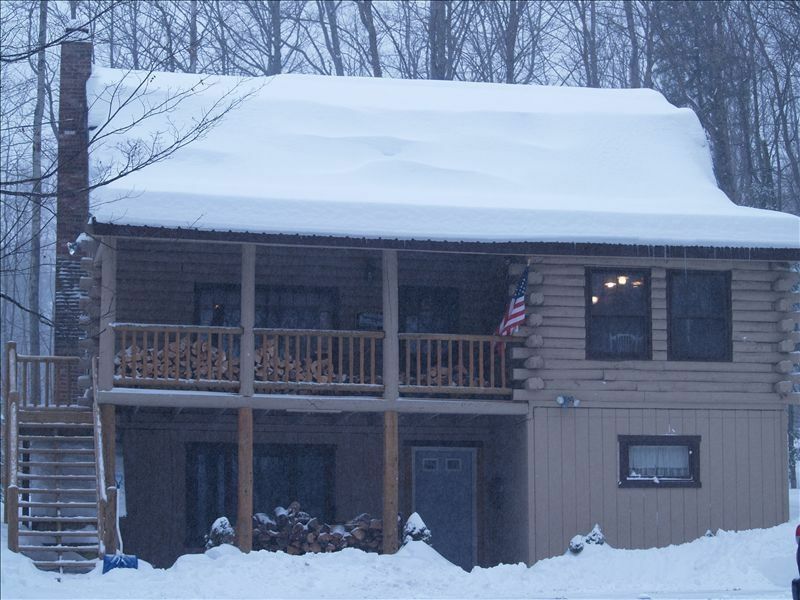 House is located on lovely, one acre private wooded lot on Okemo Mountain. Will be right near new South Face Village lift on Trailside (1/4 mile); and Less than 1 mile to base via backroads on Upper Cross road - so avoid access road traffic! So convenient! Main part of house is a 4BR/ 2BA cabin 1800 square feet with many amenities. Spacious and comfortably decorated on three levels; very updated. Large living room and kitchen area, deck with Hot Tub and Weber Gas grill, 2 outdoor fire pit areas (front & back), charming log interior with large slate fireplace and bar area. In 2013, new bathrooms, twin beds; In 2011 - New Flat screen TV's, furniture. In the Summer, 2009 - updated the roof. In Spring 2007, we replaced bedroom mattresses and installed a dishwasher in kitchen. *NO CATS ALLOWED* You will forfeit your security deposit if a cat is brought to this house. BOTH units extremely private, separate entrances. We rented this house before owning! Family of 5 from NJ, that own the house and love it all year round! Beautiful year round location in Ludlow VT - less than 1 mile from Okemo mountain; Great spring, summer and fall activities - Okemo Valley Golf course less than 2 miles away, Echo and Rescue lakes - 3 miles away. All year round fun and relaxation in our cozy log cabin home! Perfect location in winter for skiing, snowboarding, snowmobiling, sledding, and all sorts of cold weather outdoor fun! (Or sit by our beautiful slate fireplace and read a book!!). Great family getaway. In the winter, the entire family loves to ski, sled and ice skate. We have taught our 3 kids how to ski and board on Okemo mtn, it has one of the best learning programs around. Truly an incredible family mountain. On cold winter nights, we love to cozy up to the fireplace after a full day of being outdoors. Fall Foliage is also a special time, we love the apple picking and cool air! We instantly relax in the spring, summer and fall with bonfires outside in our front yard, hiking, lakes, and golf. Come and enjoy! House phones available for local use. Propane heaters; Electric in each room and tenant can control room to room; plus working wonderful fireplace. Can hold up to 6-8 cars if needed. Front deck and back deck to hang out and relax! Nearby Okemo Mtn - incredible for Skiing and Snowboarding fun! Okemo Valley only 3 miles away - great links course! Gorgeous private hot tub that can hold 8 adults is incredible! Hot Springs Hot Tub on Deck, High Speed 'Wireless' Internet throughout house (Just requires your laptop), New 48' flat screen TV with, VCR/DVD in Living Room, New 20 inch Phillips Flat Screen TV in Kid's Bunk Room with DVD/VCR & Cable, 21 inch Toshiba TV with DVD/VCR & Cable in Master Bedroom, Washer & Dryer and Stereo with 5-Changer CD Player Behind Bar, Sleds, Games, Puzzles, Books & Video Library with Over 35 Titles including Pearl Harbor, Vertical Limit, Schindler's List, the Patriot, Rules of Engagement, Titanic, 101 Dalmations, Barney, Saving Private Ryan, National Lampoon's Christmas (Vegas, Top Gun, Toy Story & Many More, Fully-Equipped Kitchen Includes Dining Area, Blender, Toaster Oven, Crock Pot, Pizza Stone, Waffle Iron, Pancake Griddle & Coffee Maker; *NO CATS ALLOWED* You will forfeit your security deposit if a cat is brought to this house. We really liked the cabin quite well! Cabin was well located in Ludlow, VT and just a short drive to the lifts. Private setting was nice. Lots of room and very comfy furniture throughout. Comfortable beds also! Kitchen was very well stocked with dishes, glassware, pots & pans and staples. Wonderful AV and TV system and WIFI worked very well. Fireplace had a great draw and was well utilized as we had plenty of wood. Back deck with the oversized hot tub was a big hit. Unlike some hot tubs the water temp was easily kept at 104 and the tub was in great shape - we utilized this bonus a lot. Leslee, the owner, was very responsive to every question we had. We will be back again! Carlton Williams and family, Plymouth, MA PS Sam's in Ludlow had great food including a fantastic salad bar. Central location with great access to Okemo and Ludlow. The place was cozy and warm with a massive hot tub. Had a technical issue with the cable but the owner was super responsive and helped get us up and running, even though they were out of country. Stayed a number of places around central VT and this place rated among the top. Well kept, lovely setting, nice little get away in the woods. Enjoyed our stay. Even though the weather was cool and rainy, the cabin was warm and inviting. Lots of amenities and extras. The bed was comfy and the hot tub was wonderful. Thank you Leslee for letting us “borrow “ your home. We’ll be back! Our recent stay at the Ducey Family Log Cabin in Ludlow, VT was nothing short of spectacular! The views were spectacular around the area and the cabin facilities were exactly as described. Communication with the owners before the stay was on point. Large Log Cabin in Quaint New England Town of Ludlow Vermont. We stayed at this place for 2 months, June & July 2018.
was seamless with timely follow-up by Leslee. She was very flexible in all aspects. All the necessities were as promised, kitchen was good size as was the kitchen table/chairs. The living room was good sized. 4 Bedrooms on 2nd floor worked out well. was a real plus and had room for 6 +. It was a great location for a Summer stay. I am sure the Winter with the snow falling, it must be spectacular. After having many conversations, it was really nice meeting Leslee, such a nice person that strived to make things right and comfortable for her guests. She always wanted things to be just right. Please inquire within to see if any specials are going on at this time, often we run discounts if rentals booked early. Also, please inquire to see if you want the extended unit to add another family to your party. The two units are extremely private and have separate entrances not connected. Reservations are not final until deposit is received. We rent on a first come, first serve basis.